The first real signs of autumn blew through the multiplex this weekend like a bone-chilling breeze, or maybe like an army of blue-eyed zombies marching toward a bunch of characters that haven’t been knocked off yet by HBO. (Sorry, it’s Monday morning. What else should we be referencing?) The lurching specter of the fall movie season, come to shrivel up the capes of superheroes like browning leaves and turn every night at the movies into award-season homework, manifested itself through more than just the continued success of Dunkirk, a serious and adult World War II story that easily could have opened around Thanksgiving instead of Independence Day. There was also the very fall-season-friendly presence of a prequel to that spinoff about that evil doll from The Conjuring. Put away the fireworks and start dragging the spooky decorations out of your spooky attic, because Halloween came early. Annabelle: Creation easily topped the box office, opening with about $35 million, which is not just $20 million more than it cost to make but also even more than its nearest competition, the aforementioned fellow Warner Bros. release Dunkirk, could shake from moviegoers’ pockets on this late weekend of a waning summer. 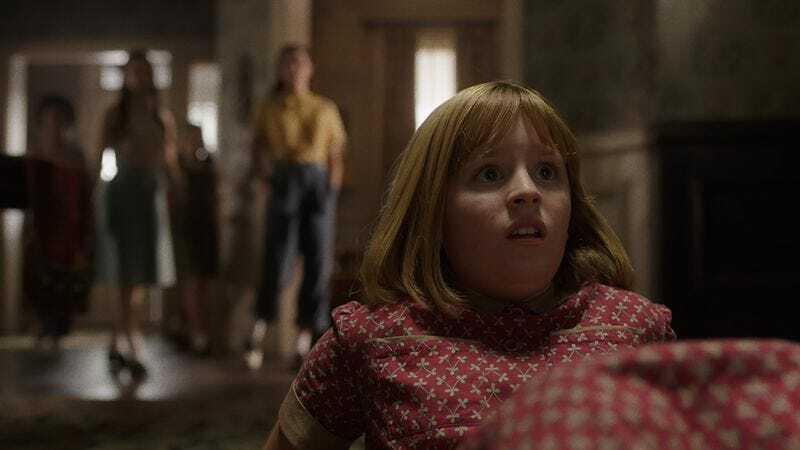 It’s the lowest debut for any film in the Conjuring extended universe, but not by much; all these movies have premiered in the neighborhood of $40 million, which is good news for such upcoming projects as The Nun, The Crooked Man, and the unannounced but inevitable The Nun V Crooked Man: Dawn Of Jump Scares. Not every franchise’s prospects are looking so hot. The Nut Job 2: Nutty By Nature, a sequel to a cheaply craven animated movie a lot people saw but few seemed to actually like, made just $8.9 million. That’s dire for a big-screen cartoon, whose reliability as a babysitting alternative (coupled with constant kid-courting after-school-commercial saturation) is usually good for at least an eight-digit opening. It’s also the worst debut ever for a movie that opened on more than 4,000 screens, besting (worsting?) the record set by another dismal animated project released just a couple of weeks ago, The Emoji Movie. Take note, animation houses: Sometimes even kids know when you’re selling them a steaming turd, voiced by Patrick Stewart or not. Meanwhile, the only other new wide release, The Glass Castle starring Brie Larson, quietly squeaked into the top ten with just $4.8 million. Honestly, it was the sleepers that came out looking best on this sleepy late-summer weekend. Girls Trip, the best-performing live-action comedy of the year, is now probably a day of ticket sales away from hitting the coveted $100 million mark—a milestone that Baby Driver passed yesterday, continuing to make it the far-and-away biggest hit of Edgar Wright’s career. (Domestically speaking, it’s made more than all of his other movies combined.) And two indies, the Aubrey Plaza vehicle Ingrid Goes West and the Robert Pattinson starrer Good Time, did solid business on a handful of screens, grossing a respective $47,072 and $34,406. We’re choosing to believe, however, that Grasshopper Films just didn’t post the earnings of phenomenal A.V. Club favorite Nocturama, because the alternative is that it didn’t make even the $800 necessary to squeeze into the box-office top 50. Or did a French drama about terrorism just belong in autumn instead of almost-autumn?